New drug therapies and medical devices save lives. In some cases, patients wait for years to participate in a clinical trial for a new drug or for that drug to come to market. It takes over a year just to complete study startup, the process of getting all the hospitals, private practices, and government health institutions that are part of a clinical trial ready to see patients. Why? Study startup is burdensome and complex–a large number of documents have to be routed and approved, and many regulatory requirements have to be met. Communication happens mostly through time-consuming methods like phone, email, and fax. Clinical research executives across pharma, biotech, and contract research organizations (CROs) identify study startup as their organization’s greatest cause for concern. Current methods and technologies for tracking site initiation (mostly error-prone spreadsheets and complex computer systems) fall short of providing users the tools they need to shorten and improve the process. 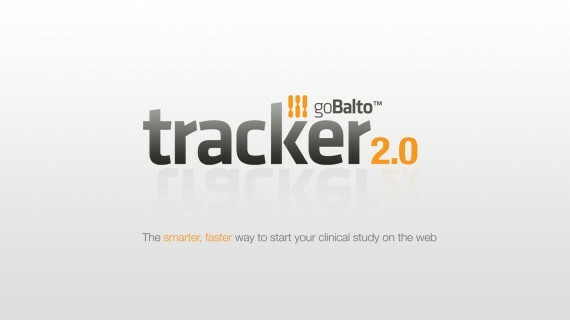 Tracker 2.0 is specifically designed to accelerate the clinical study startup process. By automating all the tasks and requirements needed to initiate clinical trial sites, we’re dramatically shortening the time it takes to get these sites activated, ultimately getting much-needed medical therapies to patients. We interviewed over 200 professionals in the pharmaceutical, biotech, and medical devices industries to gauge common concerns and themes. We also reached out to clinical trial sponsor organizations and CROs to create personas based on common user types. Combining our research results with an understanding of the day-to-day operations of those tasked with getting clinical study sites up and running, we designed a solution that addresses their pain points, simplifies their work, and eliminates non-value-added steps from their business process. Industry professionals use Tracker; our main user roles are study managers, study startup specialists, and site specialists. 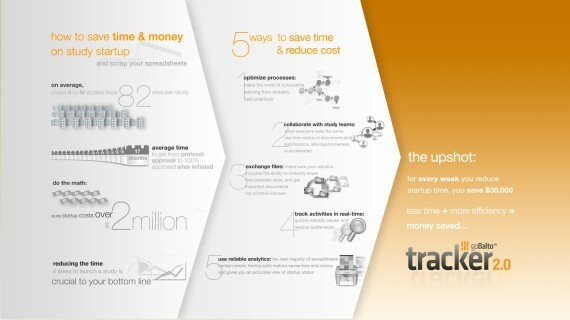 On a daily basis, Tracker allows them to monitor real-time progress, communicate with each other, exchange documents, and complete tasks in an automated, workflow-based environment, dramatically decreasing the time it takes to get through study startup. Our customers are a vital part of the requirements gathering and design phases of each Tracker release. Our Customer Success team is composed of industry experts on study startup; they’re included in our requirements gathering and review process and serve as industry liaisons to our customers. After our Product team, in conjunction with Customer Success, defines the finalized list of features, our uX team creates low-fidelity wireframes. These are shared with our product managers to confirm that all requirements are captured. After review, the wireframes are updated to high-fidelity designs that include patterns in our design library and interaction details. At this point in the process, time permitting, we iterate the design through several live and remote usability tests with customers and industry professionals using either a paper-based or functional prototype. The final design is a convergence of our research, design artifacts, customer interactions, and corporate branding.